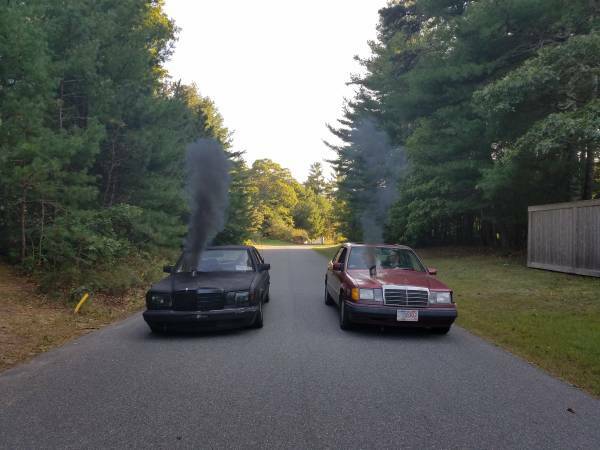 The venerable Mercedes W124 is the euro jack of all trades. The many body styles of this E-class can be found in use as taxis, limos, wagons, convertibles, sporty coupes, and super sedans. The diesel drivetrains of this era of Mercs have a loyal following because the engines run forever and rack up hundreds of thousands of miles with ease. 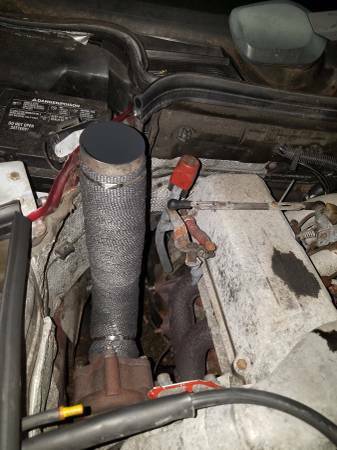 Today's diesel W124 takes a page of out the Big Three full size pick up truck playbook and routs it's shorty exhaust pipe up and out of the hood similar to a locomotive. 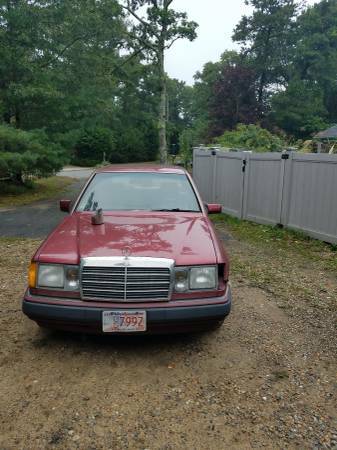 Find this 1991 Mercedes 300d for sale in Norfolk, MA for $1,500 via craigslist. Karl Benz and Gottleib Daimler might be rolling over in their graves at the sheer lunacy of the engine bay picture below. The sellers first comment is that the car is pretty much stock. The diesel injection pump has the fueling maxed out, egr is deleted, and watergate is closed. All of this has the cumulative effect of making the car drive 10x times better than stock and merging on the highway is now a breeze. The red exterior and black MB tex interior is actually a very rare combo. 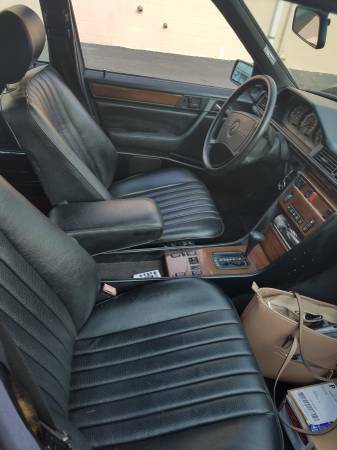 The interior shot below shows what looks to be a fancy ladies handbag in the passenger footwell. I would love to meet the lady who rides shotgun in this car. They would have a birds eye view of the the protruding exhaust pipe chimney belching out smoke at every stop light or highway merge. The 300d is a daily driver and gets upper 20s mpg. It is missing a corner light and is said to be pretty much rust free. Recent maintenance includes the following: brake pads, brake rotors, rear flex disk, and center support bearing. The delivery valves are starting to leak, but new valve seals and hard lines are included in the sale. A set of AMG replica wheels are included with the sale. Cory is working on selling a number of vintage Recaro seats on eBay. That's where my wife puts her purse when she's driving. Maybe the owner\driver is a lady - probably a way cool one at that! My wife will not let me have beers with this lady. This is dumb. Exhausting anything in front of the driver is dumb, let alone soot from a pipe that will also spew oil when your turbo seals start getting crusty. It'll make the windshield a mess, but more importantly, it'll get in the cabin. I've got a diesel, the filth comes out the back. Black lung for the driver and passengers. Sie sind Kohle Rollen! Ziz iz not good. How to ruin a MB. Awful idea.